The search is on for the next elite culinary student champions as the country’s much-anticipated and long-running competition for young talented cooks and future food entrepreneurs, JOLLY University (JU), stages a grand comeback this 2019 and is now calling on applicants for its upcoming Year 5 edition. Focusing on elevating one’s culinary passion and recreating everyday dishes with this year’s theme “Innovate. Create. Share.”, JU Year 5 aims to test the kitchen skills and creativity of challengers in coming up with their best dish creations under the modern Filipino and fusion categories. Open to all Metro Manila, South Luzon and Central Luzon college students age 16 and above, JU offers delegates an unforgettable learning experience that will greatly develop their cooking, entrepreneurial, and leadership skills as future culinary and industry leaders. An advocacy program that began in 2013, JU encourages diversity as well as collaboration across and beyond academic borders while effectively transferring key skills to talented young students. 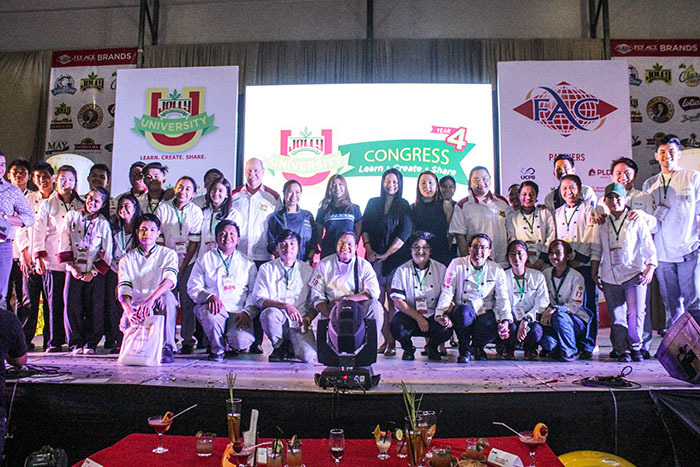 Serving as a springboard to prepare aspirants in their future careers, the highly successful campus-wide competition nurtures cooperative relationships among students and institutions in promoting culinary excellence and food business innovation in the Philippines. First, through the “Most Liked Photo” rule wherein the finalist whose dish photo garnered the highest number of likes and shares will win a Golden Ticket and advance to the final round. Liking and sharing of the top 20 finalists photos will be from Feb. 22 to March 8 and will be posted on the official Jolly Eats Facebook page. Second, under the “Most Label Collected” rule wherein one of the top 20 schools may advance to the final round if they are able to collect the most number of Jolly Food Line product labels. A corresponding point is assigned per can size. Additionally, all schools that participate in JOLLY University Year 5 have the chance to win Php50,000 worth of prizes for the most can labels collected. Participating schools can start collecting labels from Jan. 15 until March 6, 2019. This label collection promo has no bearing in the selection of the top 20 finalists. The Grand Cook-Off among the top 20 finalists will be on March 15. To know more about the JU Year 5 Search and Golden Ticket Mechanics, follow the official JOLLY Eats Facebook Page (facebook.com/JollyFoods) for application requirements and downloadable entry forms which are now available. Deadline of submission of application forms is on Feb. 15.